An exciting new concept for a floating pool in the Swan River in central Perth was launched to great fan fare this week, seeking public feedback for the concept. Oceanis has been part of the design team since the idea was conceived by NorthStar Development's Grant Oldfield more than 3 years ago. Oceanis has provided the consulting for the concept design and the options for using filtered, river water without chemicals. A brave new idea, our team is in contact with Plus Pool in New York City’s East River who also have a proposal for a floating pool using filtered river water. Read more about the project, and provide feedback here. 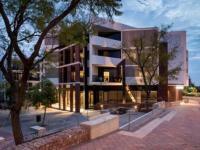 Oceanis has today moved its Perth team to new offices in Subiaco. "This is a perfect time for us to relocate. The new building allows us to accommodate our staff and clients more effectively, and with so many international and interstate clients, it was a great opportunity to make the transition to a high speed environment with NBN fibre right to our premises", Ken Shular Oceanis MD said. Working with Sabi Interiors, Oceanis designed the new office with arrangements for teams, and a breakout space for staff relaxation and casual meetings. A new internal green wall has begun to sprout, bringing a slice of nature indoors and contributing to the overall ambience. "We love the new open plan space, and the team is looking forward to enjoying the roof top lounge when the weather warms up in a few months", he said. Large parts of the Great Barrier Reef saw the hottest sea temperatures and the most severe coral bleaching ever recorded last summer - so scientists are racing to understand the demise of reefs and the prospects for their recovery. The Oceanis designed Sea Simulator in Townsville, Queensland, has become a key facilitator of this research with the Simulator’s finely controlled environmental factors enabling scientists to imitate the impact of warmer temperatures on corals. Showcased on the ABC’s Catalyst documentary into Coral Bleaching recently, view the full transcript of the Simulator's role in helping to save the Great Barrier Reef. Supporting our Indian friends affected by the catastrophic Chennai floods, Oceanis has made a significant contribution to the world-wide Chennai Relief fund. Oceanis MD, Ken Shular said "with numerous projects in Chennai, I felt it was important to stand in solidarity with the people of Chennai by contributing to the relief efforts".